Sen. Hatch Can Exhale; Rep. Chaffetz Won't Oppose Him For Senate : It's All Politics Sen. Orrin Hatch may be breathing a sigh of relief with the numerous reports that Rep. Jason Chaffetz has decided against challenging the six-term senator. 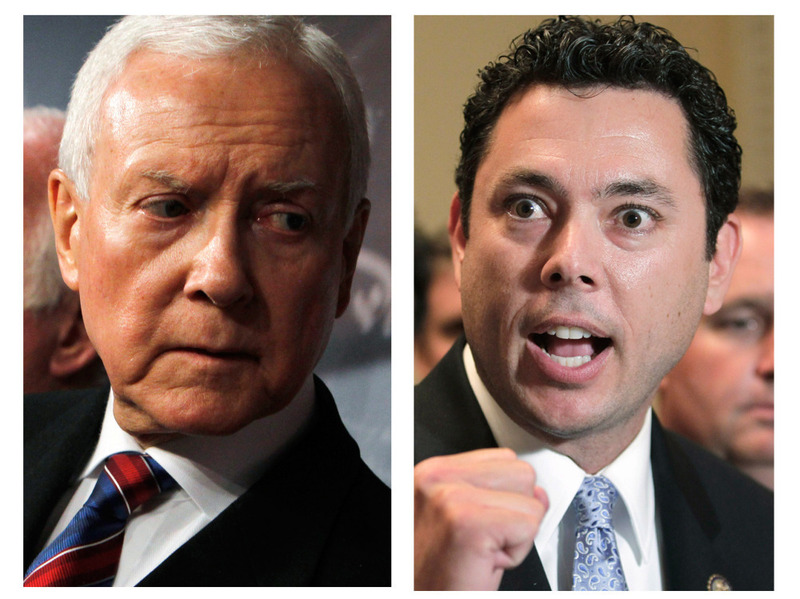 Sen Orrin Hatch (l) and Rep. Jason Chaffetz. Sen. Orrin Hatch may be breathing a sigh of relief now that Rep. Jason Chaffetz has made it official that he won't mount a primary challenge to the six-term senator's re-election. Chaffetz, who had the support of Tea Party activists, had become a significant worry for Hatch. He sponsored the DREAM Act, a bill meant to provide educational and work opportunities to young people brought illegally into the country by undocumented immigrant parents. He also was a force behind passage of the State Children's Health Insurance Program alongside the archetypal liberal, the late Sen. Ted Kennedy who was one of his closest friends. But any daylight between Hatch and the Tea Party disappeared in recent months following the loss last year of his former Senate colleague from Utah, Robert Bennett, to a Tea Party-backed challenger, Sen. Mike Lee. Hatch was widely assumed to be looking over his right shoulder at Chaffetz who could and did claim to being ideologically purer than Hatch. serving his second term in Congress, Chaffetz received a perfect score from the ACU. The 44-year old congressman is viewed as an emerging star among House Republicans. He was the chief sponsor, for instance, of the GOP's spending-cuts only "Cut, Cap and Balance" legislation. Senate Democrats rejected the bill during the debt ceiling fight. The Utah Republican Party's nominating process had Hatch especially vulnerable to a Chaffetz challenge. In fact, Chaffetz is credited with developing the strategy used to defeat incumbent Bennett last year. Bennett's 18 years in office and deeply-rooted political and religious pedigree couldn't save him from the grassroots, Tea Party effort to keep him off the Republican primary ballot. Political organizer Frank Anderson was one of the architects of the effort to unseat Bennett. Anderson repeatedly cited the Jason Chaffetz experience when describing the anti-Bennett strategy. Chaffetz unseated 6-term congressman Chris Cannon in 2008. "We started a series of home cottage meetings for close to two years," Anderson recalled in an NPR interview last year. "Seventy to 80 percent of the attendees at the meetings would be signing up as volunteers. We had over a thousand unpaid volunteers." Motivated Republican supporters are key to getting elected in Utah. The nominating process begins with neighborhood caucuses, where attendees select delegates to the state convention. Delegates often announce their support for specific candidates before caucus attendees vote. "Those who show up are the ones who become the party," Anderson noted. Chaffetz fell just one percent short of the 60 percent needed to oust Cannon from office at the state convention. But the message he sent was unmistakable. Cannon was vulnerable and Chaffetz won in the primary. Anderson and others fine-tuned the strategy and applied it to Bennett. Polls indicated that Bennett was headed for re-election in the primary and general elections. But Tea Party activists and strict constitutionalists dominated the neighborhood caucuses and the state convention. They were overwhelmingly opposed to Bennett, defeating him at the state convention and keeping him out of a primary. "It's all about motivation, motivation to get involved in this caucus system," Anderson said. "The election is pretty much decided through the caucus system and conventions long before you ever get to a primary or general election." Hatch would have faced the same strategy and challenge. Hatch saw it coming and has worked hard to develop his own grassroots support. He's also been reaching out to the activist Republicans who tend to attend neighborhood caucuses and state conventions. There are still challengers ready to try the same thing but none have the experience or political cachet Chaffetz used to revolutionize Utah politics.